They don't call it the Red Center for nothing. The three hour flight from Melbourne took us to the desert town of Alice Springs--literally in the middle of nowhere. Everything was covered in red dust and the river through town was a dry bed. Alice isn't much to speak of itself, but it's the launch point for excursions around the Outback including the largest rock in the world: Ayer's Rock, or by the original Aboriginal name (sort of), Uluru. We booked a three day, two night camping trip with The Rock tour company to see more. Our guide, Sam, picked us up from our hotel at 6am the first morning and we headed out for a four hour drive with twenty other travellers. It was a very international group with people from England, Spain, Switzerland, Morocco, Canada, lots of Germans, and of course Australians on holiday. We got to King's Canyon mid day and piled out for a hike up, down, and through the rugged terrain. While there Sam imparted many outback flora tidbits from the many medicinal uses of plants to the fact that all figs have dead wasps inside. Back in the van, we drove to our home for the night, Curtin Springs, with kangaroos hopping next to us along the road. That night we set up camp in the bush. We all pitched in to cook a delicious chili dinner with rice and vegetables over the campfire before settling into our swags. When we first heard that we'd be sleeping in swags we figured it was just the Aussie word for tents, like "torch" for flashlight and "tramping" for hiking. But swags are actually a cocoon-like canvas compartment with a thin built-in mattress in which you put your sleeping bag for warmth and then zip up. The result is that you get to sleep out, uninhibited by tent or shelter, under the stars. And what stars they are--with no light pollution for miles and miles around, the sky is so absolutely amazing and clear. The dazzling show above included an uber-bright Jupiter directly overhead, constellations ranging from the Southern Cross to Scorpio, an absurdly discernible Milky Way, and enough shooting stars to ensure the Red Sox win the world series every year for the next decade. The downside of sleeping in swag is that when it got down to 40 degrees Farenheit that night we were pretty darn cold. Who knew the Outback could be so frigid? 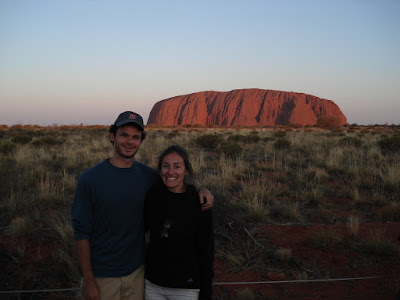 It was up at 5am the next morning to make our way to Uluru-Kata Tjuta National Park. 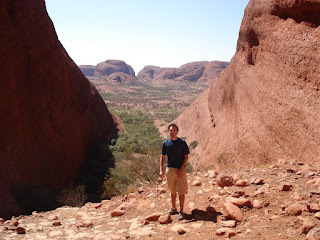 First stop was the towering rock domes at Kata Tjuta and a hike through the Valley of the Winds. Kata Tjuta is one of the most sacred sites in Aboriginal culture as they believe the domes are their ancestors. 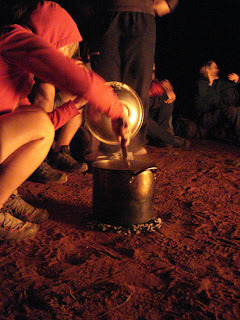 Next it was on to the Outback's main attraction, Uluru. The massive rock is stunning, and the simple elegance we saw from far away morphed into a textured, almost wavy surface from close up revealing caves and Aboriginal paintings. A visit to the onsite Aboriginal Culture Centre augmented the history and stories that Sam shared with us and we got a greater understanding of the spiritual significance of this place. Uluru is where boys were initiated and became men, where women gave birth, and nearly every tribe in Australia has heritage stories that connect back to this one spot. We watched a dramatic sunset that night that turned the rock a spectrum of reds and browns, and after another night under a blanket of twinkling stars, a beautiful sunrise. It was a long goodbye to the outback as we drove back to Alice Springs that afternoon. We'd had a fabulous time in the wild. That being said, we can't say we weren't delighted to check into the Desert Rose Inn and wash off the days of red dirt and sweat we'd caked on. And though the stucco ceiling wasn't much of a view, sleeping in a bed never felt so good. 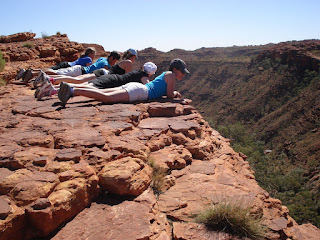 View more pictures from Alice Springs here. Sounds like an amazing trip. I would love to see a picture of that clear night over the outback that you mentioned, and the brilliant sky full of stars. I've been seen night skies that stick in my memory too ... but like you I never captured it. I wonder if it's as simple as pointing my tripod up and use the bulb setting of my camera to take a really long exposure shot? Australia is the best way to travel. you can turn your travel into Adventure travel as well. There are many places to visit that attracts tourist especially beaches etc. Thanks so much for this informative post!